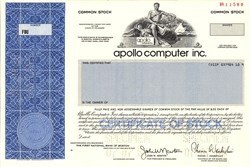 Beautiful engraved specimen certificate from the apollo computer inc dated in 1988. This historic document was printed by United States Bank Note Company and has an ornate border around it with a vignette of an allegorical man sitting and holding globe. This item has the printed signatures of the Company's Chairman and CEO, Thomas Vanderslice and Secretary and is over 28 years old. Apollo Computer, Inc., founded 1980 in Chelmsford, Massachusetts by William Poduska (a founder of Prime Computer), developed and produced Apollo/Domain workstations in the 1980s. 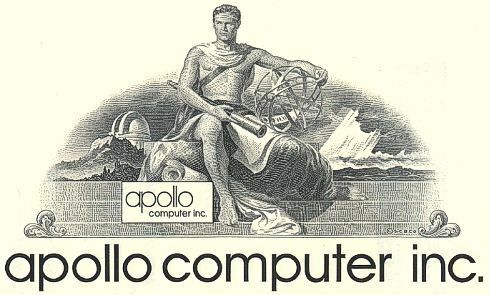 Along with Symbolics and Sun Microsystems, Apollo was one of the first vendors of graphical workstations in the 1980s. From 1980 to 1987, Apollo was the largest manufacturer of network workstations. At the end of 1987, it was third in market share after Digital Equipment Corporation and Sun Microsystems, and ahead of Hewlett-Packard and IBM. Apollo's largest customers were Mentor Graphics (electronic design), General Motors, Ford, Chrysler, Chicago Research and Trading (Options and Futures) and Boeing (mechanical design). Apollo was acquired by Hewlett-Packard in 1989 for US $476 million, and gradually closed down over the period 1990-1997. But after acquiring Apollo Computer in 1989, HP integrated a lot of Apollo technology into their own HP 9000 series of workstations and servers. The Apollo engineering center took over PA-RISC workstation development and Apollo became an HP workstation brand name (HP Apollo 9000) for a while. History from Collectible Old Stocks and Bonds (old stock certificate buyer and seller) and WWI Liberty Bonds Buyer.